Marina Kiho from Dimapur bagged the coveted Miss Nagaland 2017 title at a glittering beauty pageant held the at Regional Centre of Excellence for Music & Performing Arts (RCEMPA), Jotsoma on Friday evening, under the aegis of Beauty and Aesthetic Society, Nagaland. 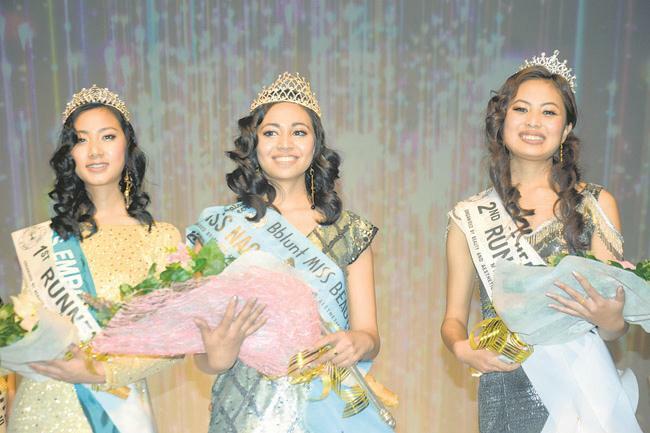 Miss Ruopfuzhano Whiso from Kohima and Miss Pewe-Tunyi from Phek district were adjudged as first and second runners up. Replying to a query as to what role she could play if she was crowned Miss Nagaland 2017, since the winner holds the title of Systematic Voters Education and Electoral Participation ambassador, Marina said she would educate the people to stand up for choosing the right candidate and spread the awareness of how a single vote could bring changes in the society. Marina walked away with a cash award of Rs 1.5 lakhs sponsored by BBLUNT, the salon products giant, Rs 10,000 sponsored by Chief Election Office and gift hampers. She also won the Miss Beautiful Hair title. The first and second runners up bagged cash prizes of Rs 1 lakh and Rs. 50000 each along with gift hampers. Pelevinuo Rupero was declared Miss Perfect Ten while Sanglitola was adjudged Miss Photogenic and Miss Talent. Meanwhile, Pewe-ü Tunyi bagged the ‘Miss Queen of hearts’ title and Ruopfuzhano Whiso was adjudged as the Miss Empower. Pelevinuo Rupreo from Kohima, Kepemshi from Kiphire, Kemeyetoly Swu from Dimapur, Moile Longkongly were among the seven finalists, out of 12 contestants from across the state. The chief judge for the event was Associate professor, department of Anthropology and former president of Beauty & Aesthetic Society of Nagaland, Kevi Naga. The others judges were– regional manager of Avon New York, Debshika Borah, Miss Dimapur 1997, Esther Jamir; head trainer BBLUNT, Manhoi Kim and OSD NSDMA, Johnny Ruangmei.